Off week rentals to accommodate car reservations i.e. Friday to Fri, Monday to Mon, No Cleaning Fee. 72 Pine Street, Edgartown proper starts at the top of the Pine Street. Bike lanes to Edgartown School, South Beach, State Beach, and OB. Sleeps 6 with-2 bedroom with a double bed in each, 3rd sleeping loft with 2 twins. Beaches: 0.5 mile to Light House Beach, 0.8 mile to Fuller Street Beach, 1 1/2 miles to Bend in Road (State) Beach, and 3 1/4 miles to South Beach. Cathedral ceiling living room, cozy 2 bedrooms (double bed in each), 1 sleeping loft (2 twin beds), a pullout sofa-bed. The house sleeps 6+. 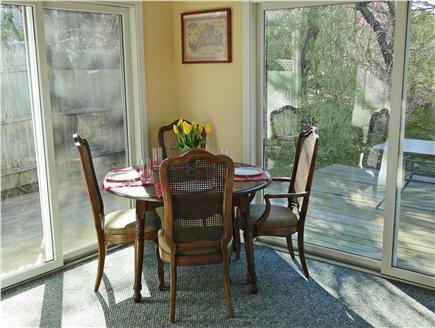 Very sunny dining area/ sitting room. There is a private deck, an outdoor shower and grill,a 12' by 14' foot sunning deck in the private backyard, with full patio set furniture. Quiet family neighborhood. 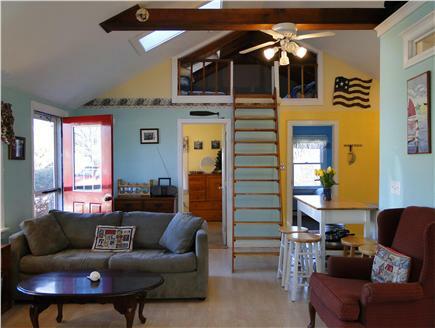 The house comes with bed linens, beach and bath towels, beach chairs, coolers, children's beach toys, surf casting rods. Additional pricing info: I welcome pets and OFFER OFF WEEK RENTALS for ferry convenience, Thurs to Thurs, Wed, to Wed, etc, State and local taxes of 9.7% will apply. Enjoyed the stay at your “Cozy Cottage”. It was just my wife and I, and my son and his wife joined us for a couple of nights. Great time with them. The beaches were great -- we made all the stops: Fuller Street Beach -- nice walk to and from, State Beach. We biked, stopped at “Crab Creek” as you suggested, catch and release, drove to South Beach for the surf . Skunked my son in hoops at the Edgartown School ( I still got it -- and a torn hammy). Got to the house a few hours early-met Lisa the cleaner-she was great-left it spotless. Had everything we needed-beach chairs are a nice touch (less to pack) gas grill with the extra tank, outdoor shower was the best, washer dryer ( I actually caught Bev wife using clothes line-I thought she forgot how) ate on the deck-so private and quiet, shops, groceries, restaurants all right there. I see you replaced the grill, stove, patio furniture and TV this year, nice. My wife Beverly may be coming in the off season (September) when all the children are back in school. Thanks again, John. Hold my spot for 2019, as Arnold said -“ I’LL BE BACK”. Thanks for the review, happy you noticed the new amenities, I try to make a noticeable improvement each year. Sounds like you had a great time except for the torn Hammy-no rematch with that, boy-retire as the champ. Beverly so proud of you with that clothes line-who would of thunk. We just spoke a few times last year and we feel like we’re old friends. Talk again this summer- with a welcome back. This is our third summer here. 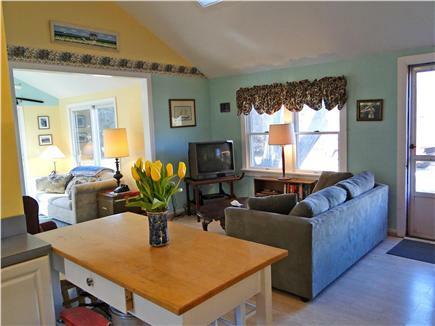 We loved the house, bright, sunny, clean, close to everything in Edgartown. Shops, dining, beaches, Dairy Queen, movies, Stop and Shop, museums and library. Bike paths at end of street to OB, South Beach and the Edgartown School-tennis courts, basketball courts, baseball field and inline hockey rink. The kids loved the walk into town and the school roller rink without us. We biked to State Beach and they had their first jump off the Jaws Bridge - we got the video. They went the next day by themselves for more. Took the “On-Time” ferry to Chappy for a day at the beach and watching the boats go through Edgartown Harbor. Must do on Chappy is the lighthouse tour with the Trustees Reservation. The owner leaves it turnkey-bed linens, towels, coolers, chairs. Easy to deal with, I ran over some of his bikes upon leaving-no problem-no charge. He said “just part of your vacation-see you next year”. And we will. Grilling on the back deck was always a great option to end a fun filled day out and about - right after enjoying the outdoor shower. The pricing was just right for a family. Couldn’t find any better pricing if you want Edgartown proper. So happy you had a great stay. My boys are older and I remember their adventures as they got older. I too have a video of my son Sam jumping of the bridge. Jack was chicken at first but eventually jumped. The youngest Daniel jumped before Jack. Hope you come back next year. Thanks. My husband, daughter and I stayed here in June for a week and really enjoyed our vacation. The house was perfect for us, located on a quiet, leafy street that was within easy walking distance to downtown Edgartown and a short cycle to the beaches. 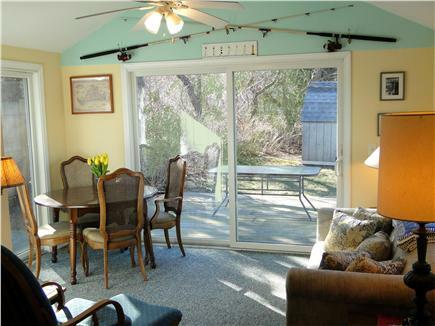 The house was well equipped and has a private back deck with grill where we could cook fresh fish from Edgartown Fish Market, which is only a 5 minute walk from the house. I'm so glad you enjoyed your stay. David said Emily was sad when you were packing the car. Hoping you return next summer and you can see her growth on the "Growing Wall." Thanks for the kind word and please be my guest next summer. Counting the days until we return! This is our 3rd year staying in this lovely home- cannot think of any improvement needed. It's obvious that the owner cares- little changes each year show his attention. We feel like we belong when we're here! You do belong, every year I make improvements, thanks for noticing. It's not perfect nor is my own home. It's not a $4,000 a week Edgartown house.. 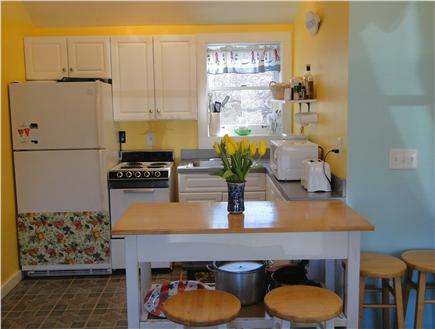 It's a $2,200 a week Vineyard cottage. My home is for everyone. Hoping to have you as my gracious guest back. Enjoy your summer. This was our second Fall stay at this beautiful cottage, and it was the perfect place for another great vacation - house was spotless, well-stocked with everything we needed, and located in a quiet, friendly, safe neighborhood with easy walk to and from town. Owner is a pleasure to work with. We're hoping to return to this island gem and would highly recommend it to others! Glad to have you back. You're a gracious and courteous guest. Thanks, Alan. Mi casa, su casa. My husband and I stayed here just after Labor Day and had an incredible week exploring Martha's Vineyard from this wonderful house in Edgartown. The house was perfect for us and we really loved the location — easily walkable to everything in Edgartown and also just a couple of blocks from the bus stop; one of our favorite things about MV is the bus system, because it's nice to just hop on the bus to check out other parts of the island and not have to drive all the time and be looking for parking! So glad you enjoyed your stay. Thanks for taking the time for your comments -- I know you're busy with holiday cooking articles. Looking forward to having you back next year. This was our first year staying in a location that was in walking distance to downtown Edgartown, and I don't think we will do our vacations any other way! It's a short walk to Main Street, maybe about 5-10 minutes. Right around the corner from Atria, Lucky Hanks, Shaws, and Bad Martha's Brewery. For professionals in their mid-twenties or even parents that would like to enjoy the town without the hassle of driving or finding parking, it is highly recommended. There were four of us for the week, and the house was the perfect size. Of course we would have loved the bedrooms and beds to be a bit bigger (both bedrooms have fulls and the loft has two twins), but you really can't beat the location. The yard was well kept and had plenty of room for yard games. The patio, grill, and outdoor shower worked great and was a nice touch. Thanks again for hosting us. We will certainly be back! Thanks for the kind words. I hope to have you as my guest again. This was the perfect spot! 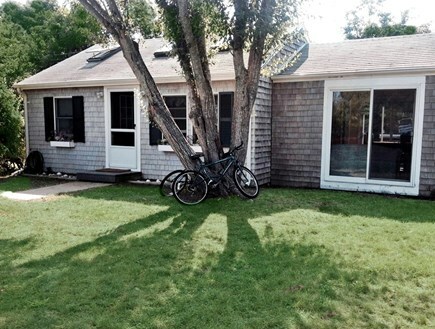 Easy to access bike routes, walking distance into Edgartown and the grocery! We had a wonderful weekend with our family and celebrating a wedding. Thank you, John!! Great family event for you. Glad you enjoyed the house. This is our second stay at this lovely home and we couldn't be more satisfied. 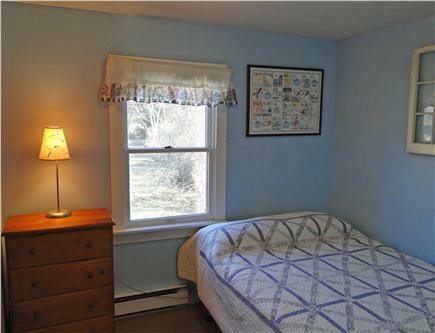 Great location, quiet neighborhood, super clean and outfitted with everything we need. Very open and sunny, lots of windows to let in the sea air. We feel like part of the Vineyard when we stay. Owner communicates quickly. We'll be back! Thanks for the kind words. You're a welcome guest, and we're glad to have you back. Great to have you and Kevin back. Enjoy your summer. Hope to have you back next year. I've been visiting the Vineyard since 1980. I've owned the cottage since 2004. 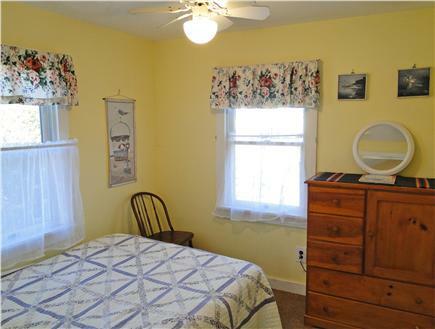 It's a clean modest cottage. I price it according to the market. 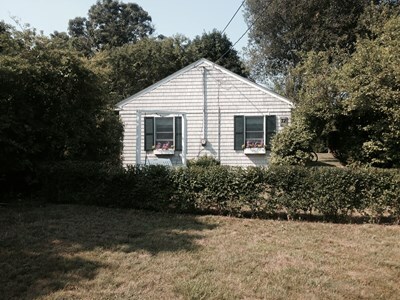 It's not a $5,000 Edgartown house-it's a $2,200-$2,600 cottage. I'm honest with my guest, don't oversell it. It's your vacation and my job is my home meets your needs. Its' the location. No need for a car. 1//2 mile to Edgartown Harbor. 1/4 mile to Stop & Shop, 1/4 mile to Edgartown School for tennis, basketball, baseball and street hockey. The Island bike paths converge at the end of the street, from there it's to 3.5 miles to South Beach, 1 mile to Town Beach and 6 miles to OB. It's a friendly mix use neighborhood of year round islanders and seasonal residence that are friendly. The back yard is very private with a large deck area for sunbathing. It's a family home with personality. I try to leave it turnkey with coolers, linens and towels, wiffleball, fishing rods, and a basketball hoop at the end of the driveway. Its Edgartown. Shops and shopping, movie theater, local restaurants that can be upscale or family style, historical buildings, library and the ferry to Chappy.